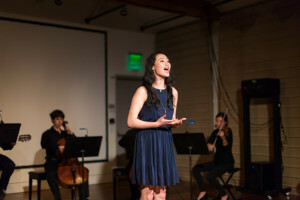 A staged concert rendition of “The Last Five Years,” composed by Jason Robert Brown, closed last Saturday after a decent two-week run which left its audiences to ponder the nature of romantic relationships both on and off stage. Directed by Ken Savage ‘14, “The Last Five Years” follows the story of Jamie, a blossoming writer, and his wife Cathy, a struggling actress living in Ohio, as they attempt to navigate their profoundly dysfunctional relationship. The show alternates between each character’s perspective; Jamie (Andrew Forsyth ‘14) tells the tale of their romance in order, while Cathy (played by Talisman’s Sarah Jiang ‘16) tells the same story in reverse chronological order, beginning with their heartbreaking divorce and ending with the youthful appeal of first love. Savage’s attention to detail in this production is uncanny – especially in such an intimate environment. Set first in Stanford’s Center for Computer Research in Music and Acoustics (CCRMA) and the following weekend in Elliott Program Center, the production shifts the genre of musical theater from its usual place on the mainstage to the up-close-and-personal arena of smaller venues. From where the audience sits, every batter of the eyelash, every trembling hand and every perfectly placed tear is unmistakable. No kiss can afford to be staged, and no reaction can afford to be overlooked. Forsyth and Jiang both rise to the challenge, displaying both immense vocal talent and the finesse possessed by only the most nuanced actors. Jiang’s passion for her unfaithful husband is palpable, and the almost sickening charisma of her big-shot ex is exceptionally believable. The ingenuity of Savage’s direction is perhaps best displayed in Forsyth’s enchanting performance of “The Schmuel Song.” Written in the style of Judeo-Russian folk music, “The Schmuel Song” details one of Jamie’s stories about an old man named Schmuel who is suddenly given 41 years of his life back, which he uses to sew a dress for the woman of his dreams. Forsyth sings it with the energy of a professional, at every step displaying the charm and whimsicality present in much of Savage’s work. From his brilliant old man impression to the cleverly handled puns and endearing dance moves used throughout the piece, the captivating artistic style of Savage’s work is unmistakable. But while the show is advertised to be a heartbreaking tale of love and loss, the potential of Cathy and Jamie’s relationship to evoke empathy is often undermined by the show’s sexist narrative. Based off of Jason Robert Brown’s own failed relationship and career as an artist, “The Last Five Years” maintains an overwhelming emphasis on the male perspective and reinforces some troubling clichés about the role of women in heterosexual relationships. Though given as much stage time as her male counterpart, Cathy’s songs consistently focus on the narrative of her lover – his career, his betrayals, his promises – and rarely on her own dreams and ambitions. “Climbing Uphill/Audition Sequence,” a song about her troubles landing parts in Ohio, effectively emerges as the only exploration of her character’s autonomy, and shines as one of Jiang’s most truthful and relatable numbers. Meanwhile, Jamie, a man caught between his desire to attain the perfect lifestyle and to canoodle every pair of breasts he locks eyes with, dominates as both the center of the show and of the couple’s relationship. Fortunately, under the seamless musical direction of Joel Chapman ‘14 (who is also featured as the show’s keyboardist), the musical component of the show helps compensate for what we lack in plot. Accompanied by a small ensemble comprised of one violinist (Sunli Kim ‘16), two cellists (Tyler DeVigal ‘16 and Lennart Jansson ‘15), a guitarist (Justin Cavazos ‘15) and a pianist (Alon Devorah ‘15), Chapman’s navigation of the challenging score is remarkable. Even in the midst of the melodrama occurring between our two protagonists, it’s nearly impossible to resist the urge to watch the passion of each instrumentalist as they undergo their own emotional voyages throughout the show. And where the sentimental content of Brown’s writing falls flat, the magic conjured by both Chapman’s miniature symphony and Jiang and Forsyth’s musical abilities proves more than capable of evoking genuine feeling. Though “The Last Five Years” is not the most moving portrayal of a relationship, it is certainly enough to make us question why we love the people we love and whether it might be possible to love in a way that’s healthier for everyone involved. Throughout it all, the inspiration to do better in our own lives emerges triumphant.